Sydney L. Moss Ltd., 1983. This variety of soapstone appears to be lianjianghuang, or 'lotus-river yellow', which bears a resemblance to tianhuang soapstone from Shoushan. Although rarer than tianhuang, it is surprisingly less sought after. 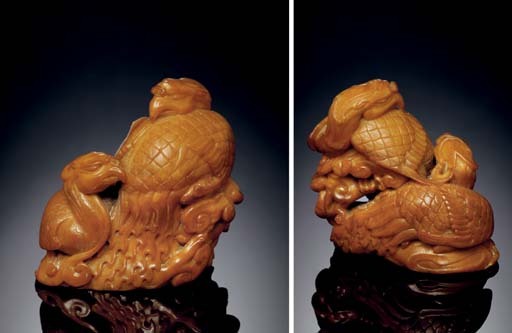 A seal carved from what appears to be the same variety of soapstone with a similar fenghuang perched on a cluster of lingzhi, possibly by the same hand as the present piece, was sold at Christie's, London, 19 February 1986, lot 359.